Dynamic Load- is the load applied to a lead screw in motion. Static Load- is the load applied to a lead screw that is not in motion. 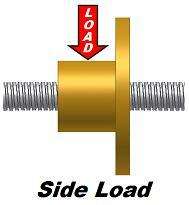 Side loads or radial loads are loads that are applied to the nut radically, perpendicular to the lead screw axis. Reference the image. Side loads should be avoided. One way to side load a nut is to not properly align the ends supports and the nut attachment point. Side loading will reduce the critical speed and may bend the lead screw permanently. Many CNC builders uninvitingly side load the ACME nut by miss aligning end support bearing or by allowing some of the weight of the y-axis carriage or the z-axis carriage to be applied to the lead screw. This should be avoided. The linear bearings should hold all of the carriage weight. Keep in mind it doesnt take much misalignment to force side loading. That is why it is important for the end support bearing blocks to be adjustable in position and not hard set. This way any misalignment can be adjusted without reworking the whole machine. 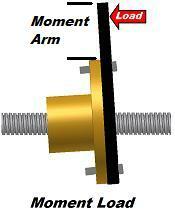 A moment load or off center load is a load that is applied to the nut off of the acme lead screws axis. Reference the image. As you can see in the image, a moment load will unevenly load the nut which can cause binding and uneven wear on the nut. It is often hard to completely avoid moment loads when using lead screws in CNC routers. However, there are ways to reduce the overturning affect of moment loads. 1.) Reduce the length of the moment arm. Always try and attach to the nut as closely as possible. This will reduce the moment force, therefore reducing the overturning affects. 2.) Make the moment and attachment point very rigid. If the arm or attachment point is weak, there will be more of a tendency to flex causing the nut to overturn. Of course the best way it to overcome moment loading is by keeping the load point inline with the lead screw axis, which is called thrust loading. 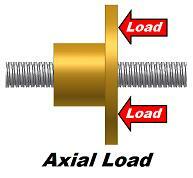 Thrust or axial loading is when a load is applied parallel to and along the lead screw axis. Reference the image. This is the best form of loading for a lead screw. When designing a CNC router, it is best to try and design your system to achieve thrust loading. 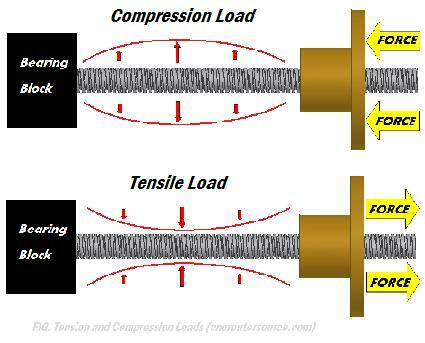 Tension and compression loading is illustrated in the image below. Both of these loading types are acceptable loading types to a degree. It is always better to have tension loading than compression. Just like a rope or cable it is far easier to pull than push. However, for a CNC router, you must utilize both compression and tensile loading unless your system utilizes a rotating nut design. With a rotating nut, the linear screw is always being pulled upon. For everyone else, make sure that your lead screw has sufficient column strength for compression loading. If the compression loading exceeds the column strength, the ACME lead screw may buckle. This will be covered in greater detail in the ACME lead screw design considerations section. You may also check out the calculators section. There you will find a column strength calculator.